With so many options to choose from, just what is the best smart watch? They’re the latest in gadget innovation and the amount of technology crammed into these devices is exemplary of just how much the world of technology has advanced in the last five or so years alone. There’s some big names out there competing, including Apple, Samsung and LG. Then there’s your classic watchmakers such as Fossil, who are developing smart technology so they can produce hybrid watches and keep up with the times. So what are the best smartwatches actually capable of? A lot, quite frankly. Many are marketed as fitness watches and keep track of your pulse, your steps, the amount of calories you burn and even how well you sleep. A generic function among smartwatches is displaying messages, emails and notifications from your phone screen. Others even allow you to play games and listen to music. It’s therefore quite important that you consider your requirements when purchasing a smartwatch. If you want one with every bell and whistle going, an Apple Watch may be your best bet but if you don’t have an iPhone, Samsung watches are also pretty decent and are compatible with Android as well as iOS. Fitbits are usually the go-tos for fitness enthusiasts, while those after a more classic look may need to head towards a watchmaker, rather than a tech company. Think about how long you want to go without charging the device, what kind of apps you require, the waterproofing levels and the kind of interface you’d prefer too. If it's solely a fitness tracker you are after, check out our guide to the best here. You may be surprised that we’re not featuring the Apple Watch as our number one product; and that’s because the Apple Watch is only compatible with iOS. Expert reviewers say this beautiful watch from LG is a good all-round gadget and it’s compatible with both iOS and Android equally, making it completely non-bias. It’s smart, and LG say it’s got some great techy features, including wrist motion controls, handwriting recognition and full integration with Google Play. But it doesn’t forget where it comes from; the star feature seems to be its slim design, which makes it comfortable and convenient to wear. Not many people can find fault with this smartwatch. It literally does everything; from displaying notifications, keeping you connected, fitness tracking, browsing, music streaming and games. Fitness enthusiasts will love the inclusion of a heart rate monitor and pedometer, while people on the go will appreciate the notification displays and ability to send and receive text messages. People seem to love and hate the battery life, due to the classic - the more you use it, the faster the juice goes down - but that’s a small price to pay for a smartwatch that does everything. This styling on this watch is very much in the classic looks department rather than a result of maximising modern technology, but the range of features don’t fall shy. Yes, the functionality isn’t as broad a purebred smartwatch, but for most people its capabilities are more than adequate. Fossil say it lets you know each time you receive a notification by giving you a gentle buzz; it also tracks your steps, distance, and calories covered; allows you to skip tracks on your device and acts as a snap button for your camera. While nowhere near as advanced as the other smartwatches on the list, for those looking to get that little bit extra out of a traditional watch, this Fossil watch is the perfect buy. Moto isn't afraid to roll back the clock with this retro-styled piece. Yes, the functionality isn’t as broad as the Apple Watch for example, but for most people its capabilities are more than adequate. Moto says it streamlines your phone to show you things that matter to you. For example, it’ll flash up messages, news and weather but doesn’t bother you with the notifications that you don’t want to see. There’s also a fitness tracker and it’s fully compatible with apps on Google Play. While compatible with Android and iOS, the consensus seems to be that it favours Android systems better. Retailers call this watch ‘timeless on the outside and revolutionary on the inside’, and we think that wraps it up really well. There are two designs to choose from; frontier, which is robust and made to withstand outdoor adventures and classic, which is elegant, minimalistic and more suited to casual day wear. This watch offers up pretty much everything the Apple Watch does, maybe just not to the same extent. There’s a microphone, GPS and applications to download via the Google Play store. You can control your music, monitor your fitness and even make calls and reply to texts. The only downsides seem to be the limited apps and storage space. There’s not too much difference between the Apple Watch 2 and 3, apart from a few performance features. Firstly, the processing power is very slightly less, secondly, the Wi-Fi performance isn’t as good (not that people like you or us would notice) and there’s less efficiency when it comes to wireless performance. Lastly, there’s no cellular connection, which means, unlike the Apple Watch 3, it doesn’t operate off the same phone number. Aside from that, it pretty much boasts the same brilliant features, access to apps, fitness, notifications and messaging etc. But if you’re planning on spending that much on a watch, is the £40 between the two RRPs worth quibbling about? 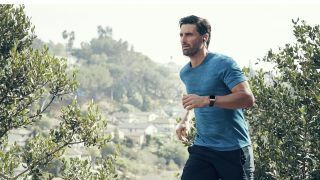 This is the cream of the crop of the Fitbit lot, with its smartwatch capabilities making it more than just a fitness tracker. Tracking activity, sleep, and with workout video playback, this watch has been optimised for fitness, but has a few extra gems incorporated so it can keep up with the competition. You can receive notifications, store 300+ songs and there’s even a GPS function for measuring your pace and an app for guided breathing exercises. Reviewers highly recommend this smartwatch - just don’t expect it to deliver as much in the way of applications as some of the other smartwatches in this list. Looking to kit yourself out with new gym gear? Read our round-up of the best men's running shoes and the best women's running shoes for inspiration.